Rose Marshall knows death. She is dead, made into a hitchhiking ghost by Bobby Cross who hunts her still. However, now Bobby Cross has done the unthinkable; he has found a way to make her alive again, without the protection of Persephone. Now Rose has to track down someone alive willing to help her, make her way to the Underworld and then back the land of the dead before Bobby Cross gets what he wants…her. 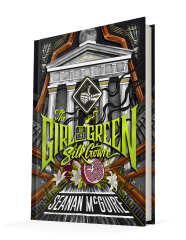 Published July 3, 2018, by DAW The Girl in the Green Silk Gown by Seanan McGuire is the second novel following hitch-hiking ghost Rose Marshall in the Twilight and her never-ending battle with Bobby Cross. What a wonderful sequel. 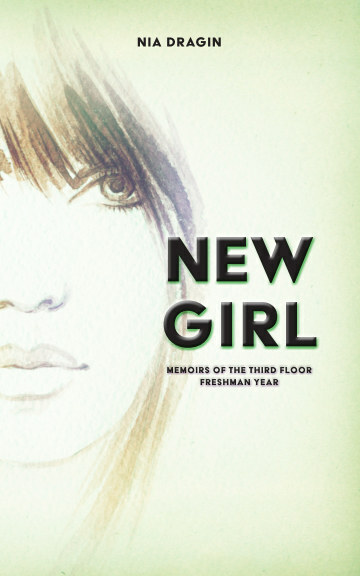 This novel differs from the first novel in only a few ways, but boy they are significant ways. The principal way that truly impacts the reader’s enjoyment of this novel is the fact that, unlike Sparrow Hill Road, this novel is linear. Girl in the Green Silk Gown does not jump back and forth between decades to showcase who Rose is as a ghost. Instead, it picks up after that last instance, bringing together many of those essential details from the previous novel, in order to tell this story. It moves effortless, from beginning to end following Rose on her new journey in the land of the living. Not to spoil anything but Bobby Cross succeeds in the impossible, he makes Rose human again, and Rose, she does not want it. So once again she is on the road hitchhiking her way as a mortal sixteen-year-old girl, who can die again, or live a very long life. It is her choice, but one she does not want. Rose made her peace with being a ghost, and the world she is in now, it is not her world, it is not the one she lived in before death, nor is it the one she lived in after her death. Everyone she ever loved has moved on or is waiting for her in the Twilight. So it is an emotional tension driven story for Rose, delving deeper into her persona. Rose always did have a fierce personality, but now there is a vulnerability to it as well, which was left undeveloped in the previous novel. So it is enjoyable to McGuire develop her character in this novel and give her a little more dimension. Along with her mortality are the truths she has to face. There is incredible tension in the novel between the characters because they all have to face the past; these choices that have put them on this journey. It is interesting to see these character dynamics flourish because of this, and for some of the characters, the development is intense. For other minor characters, admittedly their development is limited, but they do not have much of an impact on the story, so it is not something worthy of concern. The characters that need the attention get it that is the critical part. The added element of spectral beings across the pond, as well as the Greek Mythology element, gives the novel another edge. It sets it apart from any standard ghost story and gives it this otherworldliness intrigue. The way McGuire incorporates it into the narrative does not feel out of place. It is an American based ghost story, but the Greek artifacts added blend so well into the plot. Greek Mythology makes it unique, and McGuire’s writing is so strong because the pace never falters while she does this.